Mid-level production embroiderers depend on medium-sized production embroidery machines to get the job done right. 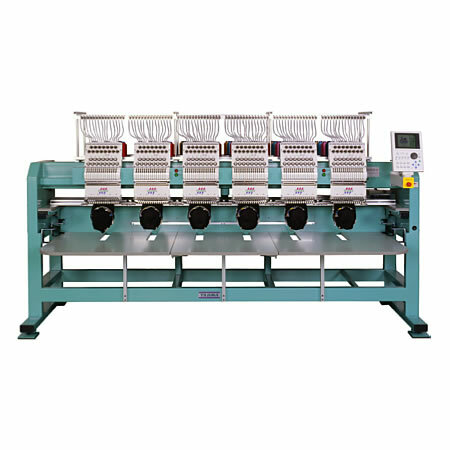 Tajima has the widest selection of 2, 4, 6 and 8 head embroidery machines in the industry. Faster production runs, more consistent stitching, higher design quality and reduced setup times make Tajima commercial embroidery machines the most efficient and reliable embroidery equipment in the world today. It’s no wonder that more & more Production Embroidery Shops depend on Tajima than any other brand! Powered by Tajima’s exclusive Patented Micro-Smart Technology system, which closely manages machine operation, guaranteeing the most accurate stitch placement while heading off problems before they occur. Special new head design that allows stitching right up to the peak of a cap. No loss of design information in the event of a power failure. Quick change system which minimises downtime between jobs by making the changeover process from caps to tubular (and back) lightning fast. The use of Tajima’s labour saving .tbf format. Unique machine management integration with 2-way reporting. Easy design management with Barcode reading technology. Included is delivery, onsite training, tubular frames and a 2 year parts & labour warranty. Call AJS Embroidery 0115 945 9460 and we’ll be glad to answer any questions about Tajima embroidery machines.